Acronis Backup allows you to create a disaster recovery plan that contains instructions on how to recover data from backup archive in case of system failure. The program can send Disaster Recovery Plan by e-mail to specified users. (!) 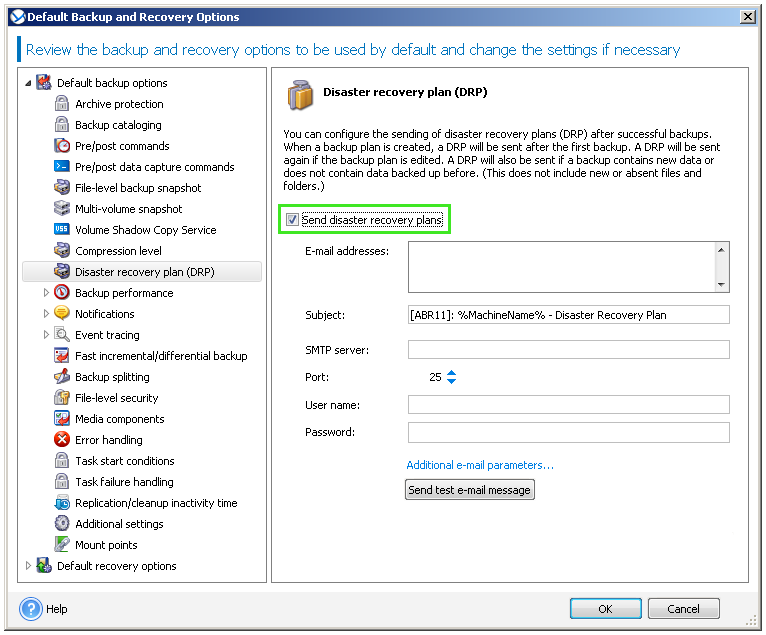 Disaster recovery plan is not available when backing up using Acronis Bootable Rescue Media. Disaster Recovery Plan is generated by Acronis Agent after backup. A new Disaster Recovery Plan is sent if the backup plan has been edited and recovery parameters changed or if the items to back up changed. (!) 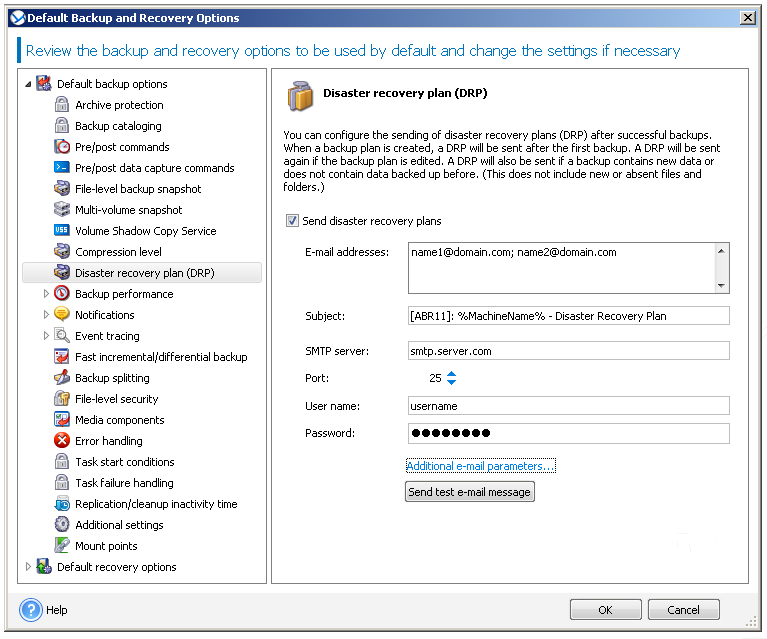 Disaster Recovery Plan points only to the location(s) specified in backup plan. It does not automatically change if backups are moved or copied manually or using post-backup commands. 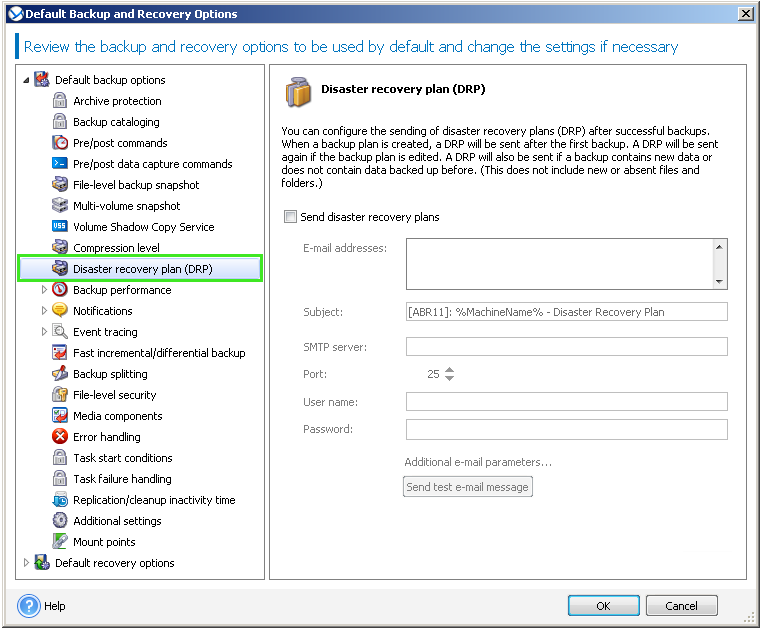 To set up Disaster Recovery Plan parameters for all backup tasks, go to Options -> Default backup and recovery options -> Defaut backup options -> Disaster Recovery Plan(DRP). To set up Disaster Recovery Plan parameters for a specific task, go to Plan Parameters -> Backup options -> Disaster Recovery Plan (DRP). If your SMTP server requires authentication, enter User name and Password in the appropriate fields. You can press Send test e-mail message to check whether Disaster Recovery Plans are sent correctly with the specified settings.